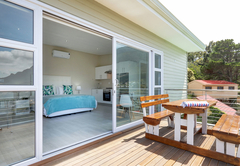 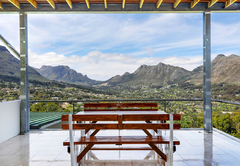 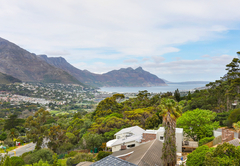 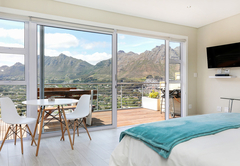 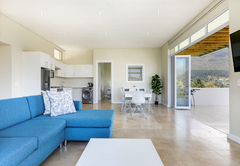 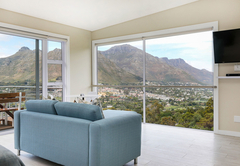 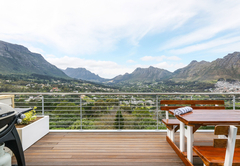 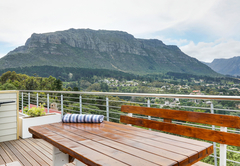 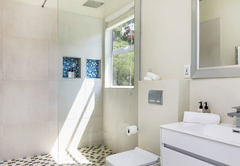 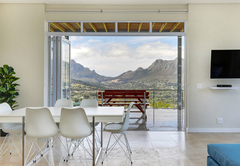 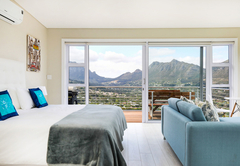 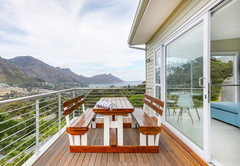 Mount Bay is a property providing self catering in Hout Bay for tourists visiting the Atlantic Seaboard region. 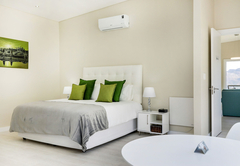 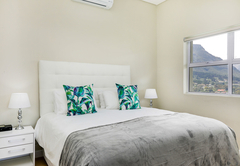 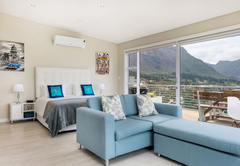 Situated in the scenic holiday destination of Hout Bay, Mount Bay offers lovely accommodation in four apartments. 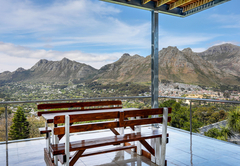 Cape Town city centre, the V&A Waterfront and the stadium are all a short drive away. 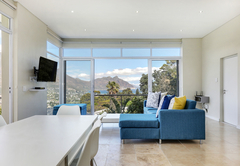 There are lovely shops, restaurants and beaches within Hout Bay. 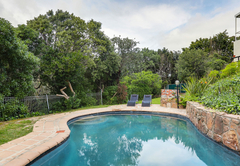 The self catering apartments are modern and secure with access to a swimming pool. 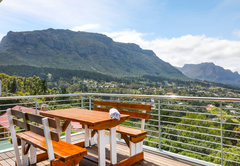 They have off street parking, alarmed response, Wi-Fi, daily housekeeping and braai facilities. 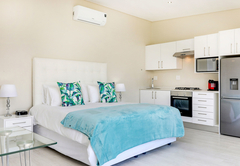 The apartment has one large bedroom furnished with a King-size bed. 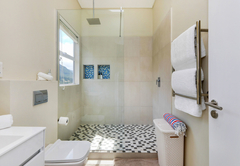 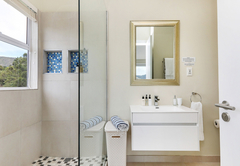 The bathroom has a large shower. 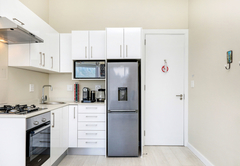 The kitchen is fully equipped for self catering and braai facilities are provided. 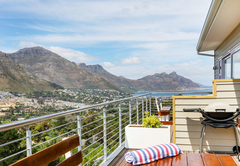 There is a balcony with sea and mountain views. 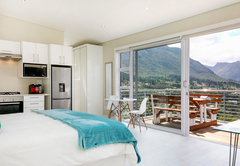 This large family suite has its own entrance. 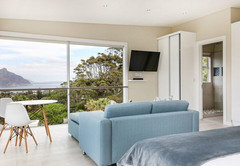 The suite sleeps two adults and two children in a King-size bed and sleeper couch and has a bathroom with a shower. 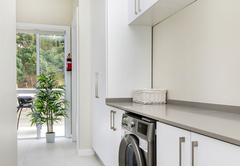 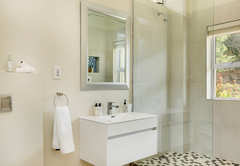 There is a fully equipped kitchen and a comfortably furnished living area which opens to a patio. 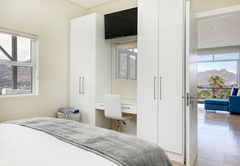 This large suite is furnished with a King-size bed and has a separate bathroom with a shower. 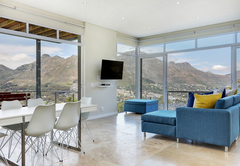 There is an open plan living area and a spacious balcony. 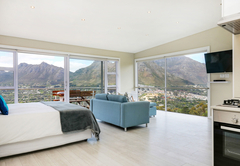 The suite sleeps two in a King-size bed. 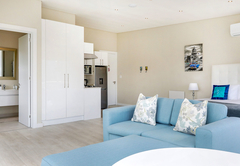 There is a fully equipped kitchen, balcony, bathroom and living room. 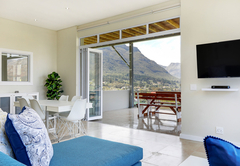 It is a large 1 bedroom suite with its own entrance, and spans out onto a balcony with sea & mountain views & swimming pool in garden below. 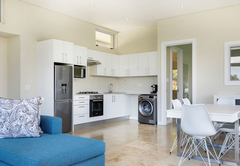 It sleeps two and features a large bedroom with extra length king size bed, equipped kitchen, living room with TV. 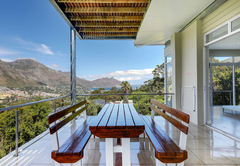 It is a large family suite with its own entrance, and spans out onto a balcony with sea & mountain views. 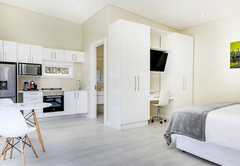 It sleeps two adults and 2 kids and features a large separate bedroom with extra length king size bed, equipped kitchen, living room with TV. 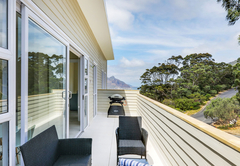 It is a large 1 bedroom suite with its own entrance, and spans out onto a balcony with sea & mountain views. 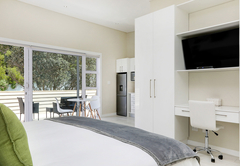 It sleeps two and features a large bedroom with extra length king size bed, equipped kitchen, living room with TV. 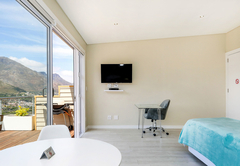 It is a large 1 bedroom suite with its own entrance, and spans out onto a balcony with valley views & swimming pool in garden below. 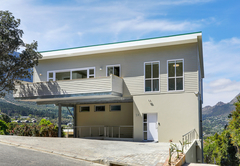 It sleeps two and features a large bedroom with extra length king size bed, equipped kitchen, living room with TV. 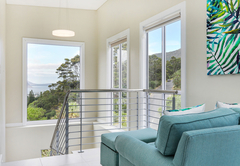 Response timeMount Bay typically responds to requests in 5-10 minutes.